Welcome “Industry 4.0,” where it’s never been more straightforward (and more necessary) to jump on the digital transformation bandwagon. Business intelligence systems—like Microsoft’s Azure and Power BI—are making it easier for manufacturers to harness their data in a matter of weeks, not years. By automating the process of corralling data and connecting it to KPI-centric dashboards, manufacturers are changing the way they do business. 1. How You Engage with Your Customers: Whether you’re B2B or B2C, your customers care about on-time delivery, quality, cost, and predictability of service. Using Power BI, manufacturers can zero-in on every step of the production process, ensuring operations, delivery, costs, and quality control are operating at peak efficiency. And when they’re not, the person responsible will be the first to sound the alarm, knowing the same insight is available to everyone. 2. How You Empower Your Employees: Design blames production, accounting blames sales. Eliminate the cancer of the blame-game by giving every employee a shared picture of progress against goals. Empirically identifying constraints drastically reduces finger pointing and empowers operators to make critical decisions on the ground. 3. How You Take Action: Rather than wasting time pouring over reports that lag by days (or weeks), real-time visibility allows you to make decisions by exception, on the issues that impact outcomes the most. Using Power BI, you can stop being overwhelmed by whatever urgent issues barge into your office and instead proactively focus in on root issues that move the needle. 4. How You Optimize Operations: By automating the process of aggregating your data into a data warehouse, you can gain the reliability of a scalable, single source of truth. This allows executives and operators alike to navigate via a single pane of glass, in near real-time, giving everyone easy access to metrics that optimize inventory, reduce waste, and shorten order-to-cash and time-to-ship metrics. 5. The Nature of Your Business Models: Improve your supply chain efficiency and fluidity by connecting your inventory data to your suppliers and distributors. With predictive analytics, anticipate inventory shortages and surpluses before they materialize, and alert your suppliers to inventory needs in real-time. 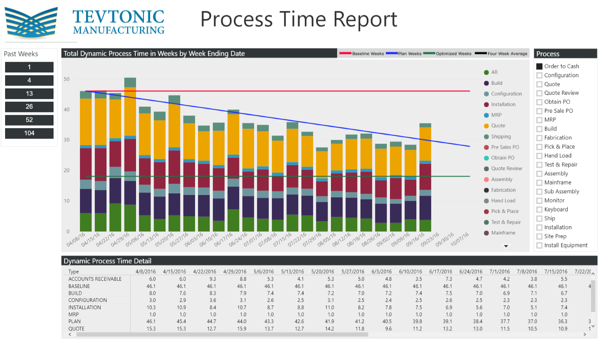 If you’re interested in learning more about how Power BI can impact your manufacturing process, tune into our on-demand webinar. Hosted in partnership with Microsoft, we explore how manufacturers are maintaining leadership by leveraging analytics to maximize profitability. Ready to put your data to work? Please contact jon.thompson@bluemargin.com to get started!